The DevelopHER Awards is an annual not for profit awards ceremony recognising women who work in the technology sector in East Anglia. The awards were inspired by the team at Norwich based SyncDevelopHER, who regularly attend and speak at events promoting gender equality. 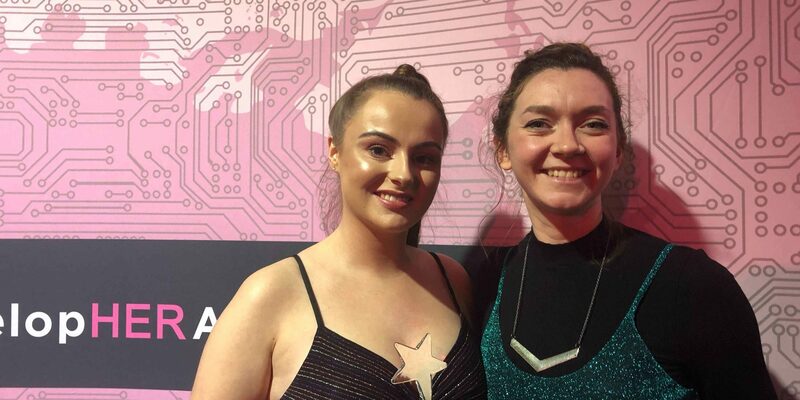 SyncDevelopHER’s founder, Vickie Allen, is the force behind the awards and since East Anglia’s addition to the Tech Nation map, she is keen to build an East Anglian network. We nominated Eva back in September and found out she had made the shortlist on October 31st. With only a few weeks till the awards ceremony, it was a very exciting time for the Studio. The awards ceremony took place on 28th November, at OPEN Norwich. It was a great evening in celebration of talented women in the technology industry. It was a massive bonus that Eva won the award, which recognises her great work and dedication as an apprentice. We are very proud of Eva and have added her award to our ever-expanding collection! It was such a nice surprise to be chosen as the winner of the apprentice award. I’m so happy to see that we are celebrating both women and apprentices in the technology industry. A very proud moment within my career!